Verizon has announced the upcoming HTC Thunderbolt with LTE 4G support, a likely successor to the very popular HTC Incredible. 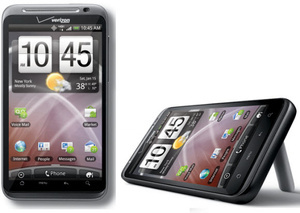 The smartphone has a large 4.3-inch Super LCD display, a 1GHz processor, and run on Android 2.2 with HTC Sense 2.0. The updated Sense has the new "Fast Boot" for quicker booting of the OS. When connected to Verizon's LTE 4G, the carrier says users should expect down speeds of 5-12Mbps and up speeds of 2-5Mbps. The device has Mobile Hotspot capability for sharing the 4G connection with up to 8 Wi-Fi devices, as well. Additionally, the smartphone has an 8MP standard camera and a 1.3MP front-side camera, along with Dolby and SRS surround sound. Skype video conferencing is built right into Sense and the Thunderbolt has DLNA streaming multimedia support. We are proud to not only be bringing one of the first 4G LTE Android smartphones to the Verizon Wireless network, but to offer people the unprecedented speed and ease of use that the HTC ThunderBolt provides to them. What makes 4G so compelling is not just technology, but what the technology allows people to do. With HTC ThunderBolt and the Verizon Wireless 4G LTE network, 4G is brought to life as people stay connected with friends, family and content faster than ever before possible. Not impressive at all? Needs dual core, hdmi, better camera don't care about ' mega pixels' the blackberry 5mp is way better. Also who wants to have those 4g speeds but be limited with data use? Not me. I'd rather keep my $22 unlimited 3g. According to Engadget and some other sources, I thought that it said it would include HDMI. Is this true? Correct me if I'm wrong.